A new competition being run by Tangent challenges students to come up with solutions to social problems chosen by the College community. Provost Patrick Prendergast speaking at the launch of Tangent last year. Students will be challenged to come up with solutions to a set of social problems chosen by the College community, with the chance of winning €10,000 in funding, as part of an innovation project led by Provost Patrick Prendergast. The competition, which is being run by Trinity’s entrepreneurship hub, Tangent, offers students the chance to tackle issues such as homelessness and pollution, with the chance of developing their ideas through Trinity’s Launchbox programme. The list of social issues includes healthcare inefficiencies, reliance on plastics, migration, and privacy and data protection, alongside pollution and homelessness. Students and staff can vote on the College’s website for the one they think is most pressing. Students who sign up to compete in the programme will come up with their solutions in a hackathon that runs from April 5th to 7th. After the hackathon, two winning ideas will be chosen. These will receive the €10,000 funding and will be awarded a space on Launchbox this summer. “We want our students to become leaders and to have a positive impact on society and the world”, he said. Prendergast’s new project is one of the programmes funded by Tangent, Trinity’s “ideas workspace” that aims to train students in innovation and entrepreneurship. 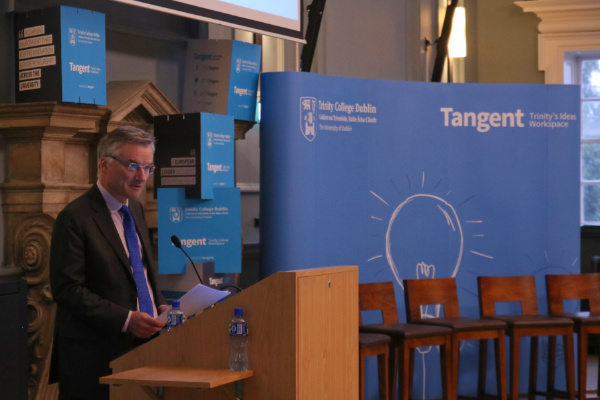 Speaking at the launch of Tangent last September, Prendergast said the programme’s goal is to “provide an interface between Trinity and the bustling innovation ecosystem on our doorstep”. In October, Tangent Pioneers, an accelerator programme launched by Tangent, sent six student startups to America to develop new contacts in the US and widen their entrepreneurial networks.